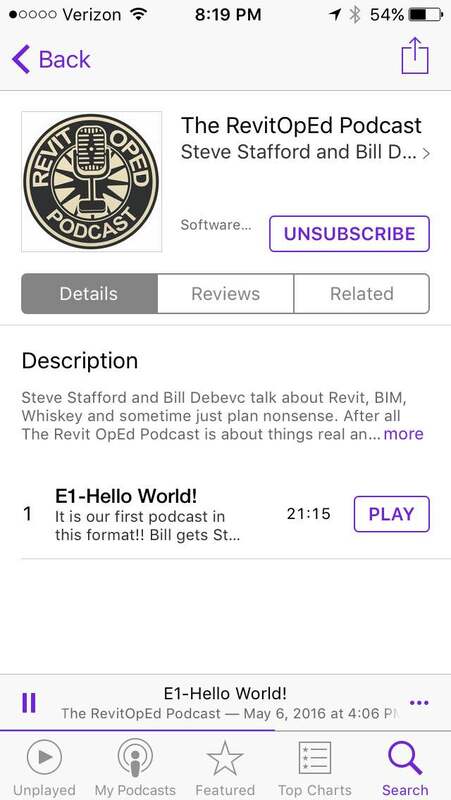 Bill Debevc just celebrated his first anniversary of BIM Thoughts. We talked about doing a separate podcast together tied to what I do with this blog in some way. He made sure we actually started it by sending me a meeting invitation. He's doing the heavy lifting of preparing it for me. I get to show up, chat with him for a bit and wander off again. Last night it was finally listed at iTunes, you can search for it there now using Apple's Podcast app or your other favorite Podcast software. We've set up a blog site to store episode notes and allow for comments. It's still under development so don't be surprised if it changes over the next month or so. Our first episode is called Hello World!. It is possible to just listen to each episode on the blog site too. Bill came up with our nice podcast logo. I asked my daughter to create one and liked her initial design sketch a lot but she's got so much school work I took it off her plate. My son Jake did the intro/outro music for us, thanks! Bill, thanks for making me do it! We hope people listen and enjoy it. BIM & the Digital Transformation of Construction.